Find out how you can fix the dreaded "no SIM card" error. Have you tried inserting a SIM card on your Android phone and it shows a “no SIM card” error? I feel your pain. I tend to change my SIM cards frequently to avoid my exes, and changing them is never easy. Aside from the struggle to pry open my phone’s back cover, I need to coax the old SIM card and replace it with a new one. Oftentimes, I get the dreaded no SIM card error. A no SIM card error can sometimes occur even if you’re not changing your SIM. There are a few reasons why your phone cannot detect your new SIM card. The usual reason is that the card was not inserted properly. So you need to make sure that the SIM card fits snugly into the tray. Since SIM cards are usually sold attached to larger wallet-size cards, removing the SIM card often results in bending and even breakage. Make sure to straighten a bent SIM card if that’s the case. In this article, I will lay out some of the techniques that I use for fixing the no SIM card error problem. Restarting your mobile device is the easiest and quickest way to fix the no SIM card error. Restarting your phone refreshes most applications and software in your device, thereby fixing any minor errors. Oftentimes, your smartphone failed to detect the new SIM card and needs to be restarted to be able to do so. Sometimes, in our hurry or excitement to use our new SIM card, we fail to place it securely on its tray. If the SIM card is not placed firmly and securely on the tray, your phone will lose connection to the card and this will result in network errors. Make sure that your SIM card is flat – not bent – before placing it on the tray. Some SIM cards are “triple cut” or 3-in-1 SIM cards, which means that they contain a regular, a micro, and a nano SIM card. 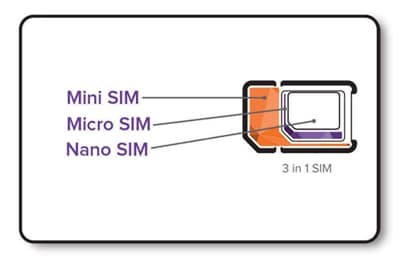 If you’re using a 3-in-1 SIM card, the smaller cards (micro and nano) may bulge, so be sure to flatten the entire SIM card before inserting it into your device. A triple cut or 3-in-1 SIM card. Some people use adhesive tape or a piece of paper to affix the SIM card securely in its place. You can use this trick if you think that the tray is too wide or loose. Take a look at your SIM tray and check if it’s dirty or full of dust. Blow out the dust particles or gently wipe the tray with a clean cloth or tissue. You can also wipe clean the SIM card in case there are fingerprints or dirt on it. If cleaning the SIM card or tray doesn’t resolve the issue, try using a different SIM card on your device. If other SIM cards work perfectly on your phone, then the problem is with your SIM card and not with your phone. In that case, bring the SIM card to your carrier to have it replaced. 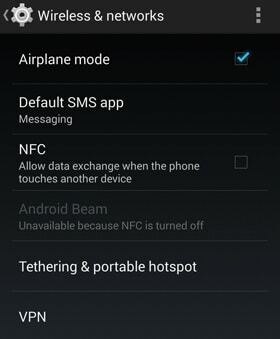 Toggling airplane mode in Android. Toggling airplane mode (or flight mode) on your mobile device may fix the no SIM card error. Pull down the notifications pane or go to Settings and switch airplane mode on. Wait for one minute and then switch it off. This will force the phone to look for available networks and hopefully solve the no SIM card error issue. Make sure that your network mode is set to automatic or that your phone automatically chooses the network. Go to your Settings, choose Mobile Networks (or something similar), and then under Network Mode, select LTE/WCDMA/GSM (auto-connect). In other Android phones, you can simply switch on a button to choose the network automatically. This method is a last resort and should not be attempted if you don’t know what you are doing. I will not be held responsible for anything that will happen should you attempt this procedure. Resetting your device to factory settings will wipe out all data on your phone as well as all third-party application installed on it. So before you attempt this method, please back up all data to the cloud or to an external drive. Most Android phones have the option to back up your data to the cloud or to Google’s servers. Just go to Settings, then look for Backup and Restore (or Backup and Reset) and switch it on. Make sure that Automatic Restore is toggled on. Once all your data is backed up, tap Factory Data Reset. Your phone will then automatically reboot with a clean slate. Check if it’s able to detect your SIM card. A no SIM card error is one of the minor annoyances of using a mobile phone. Please let me know if you still can’t solve the issue using any of the techniques mentioned above by posting a comment.